The bedding is so beautiful- my bedding is showing wear and tear however no money in the budget right now but I will keep this website in mind when it is time to buy. We really need a new bedding set, its been a couple years since we changed it. I am checking out this deal to see if we can get a great stylish set without breaking the budget! Thanks! Thanks for the code we are in desperate need of new bedding! Love this pattern and thanks for the sale info! Pretty and bright colors of the bedding . Thanks for the code also when purchasing from here. Being bedding is so expensive this is great. 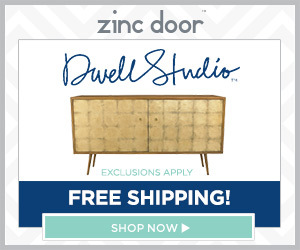 I found Zinc Door a few months ago and LoVe their site. And these Trink Turk linens are beautiful – modern without being cold. Thanks for the lead. I have not heard of Zinc Door before, but checked and they do have lovely bedding. I love to change up my room with the seasons. Though I can’t change everything this year, some new pillows and a throw will sure help! Thanks for the tip. I have never heard of them before. I really like their designs. I will keep them in mind next time I need a new bedset.